Many of our readers requested to publish a NodeJs user registration tutorial with MongoDB. In some previous NodeJs tutorials, we explored NodeJS PassportJS Login, NodeJS send email tutorial and many others. In this tutorial, you are going to learn nodejs user registration with MongoDB. You can find the source code of this tutorial on this GitHub repository. Following tasks are performed in this tutorial. To create a database in MongoDB, first, you need to install MongoDB on your system. You can install MongoDB community edition on Windows, Mac or Linux. Please go to MongoDB downloads. After downloading, install MongoDB on your system. If you are running MongoDB first time, create data directory because the mongod process needs to write to the data directory. If you are using Windows create a directory data in C drive. Then create a directory db inside it or on command line create a directory using command mkdir -p /data/db. Open a second command prompt window to access interactive mongo shell. 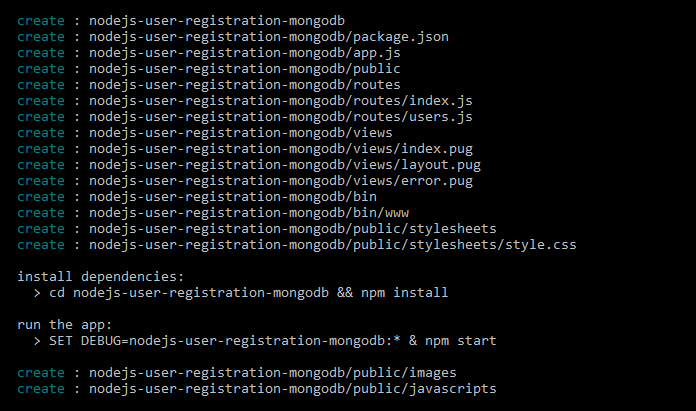 After setting system path, type mongo or ./bin/mongo. By default, MongoDB connects to localhost on port 27017. The current database is switched to dbusers database. To view data in users collection. To create a nodejs application first install nodejs on your system. Now using NPM, install the express generator. This module is used to create a NodeJS, Express JS app. After installation, open the directory where you want to create the application. Like on windows type cd c:\ and then type the following command. A NodeJS, Express application is generated. Next to install required packages and dependencies. To run this application, type command below. To model MongoDB collections, mongoose is used. Install mongoose package using npm. Mongoose is included using require. A schema is created using mongoose.schma. Next, there is an email validation utility method. After this method, UserSchma is created. 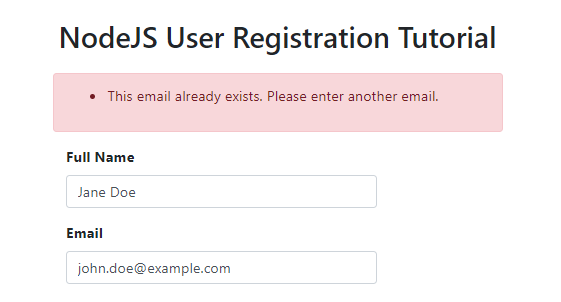 Inside user schema fields like full_name, email. 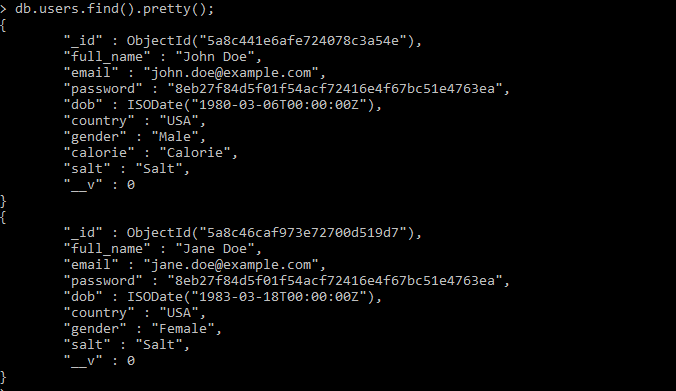 password, date of birth, country, gender, food preference like calorie and salt are added as string data types with validations and messages. In the last, userSchema is exported using modules.export so other modules can use it. 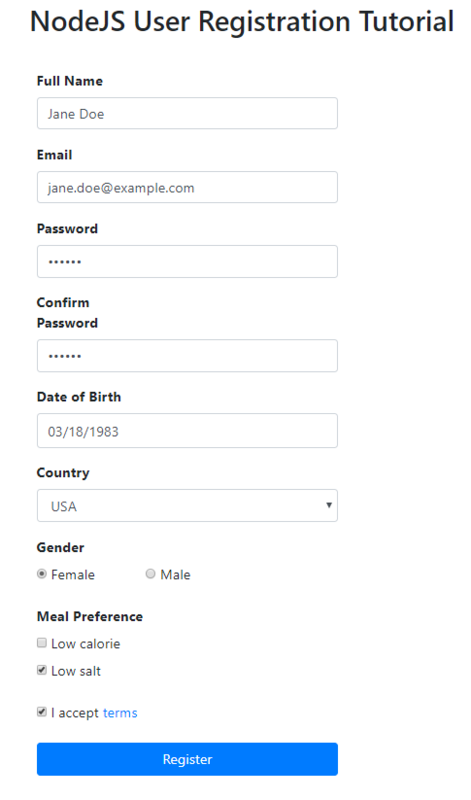 Before coding part let us first create HTML form to take user data. Open Views folder, open layout.pug file, replace existing code with the code below. In this code above bootstrap file is included so we can create an HTML form using bootstrap. Open index.pug file in views folder. Replace the code below block content. After the user fills in the form and clicks Register button, data is sent to the server. First, inside jQuery ready method a click event handler method of register button is created. 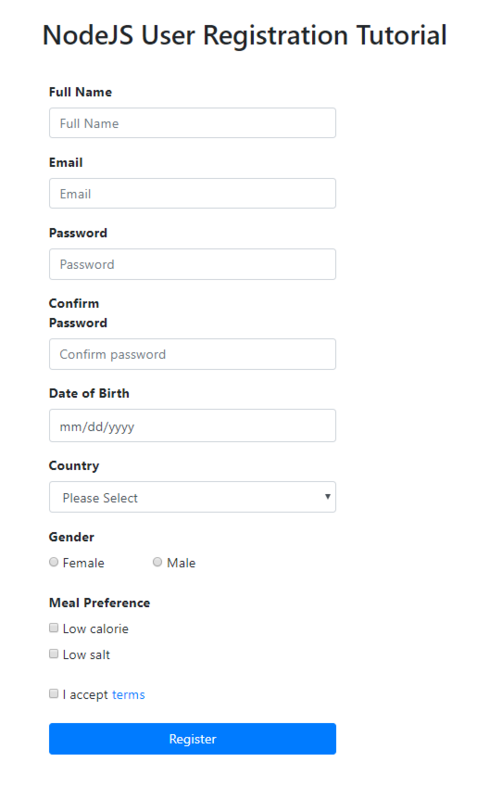 Name, email, password, country, gender, calories, and salt values are assigned to variables. A checkbox for accepting terms and conditions is also added and its value is assigned to a variable. 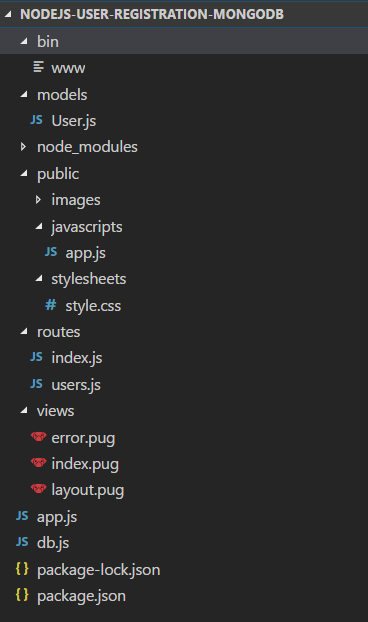 Open index.js file in routes folder. To validate data, express-validate module is installed. Open command line and run the command. Open index.js file and add the code. First mongoose is included and after that users, model is included. To validate data entered data, express-validator is included. Add the code below, after ‘/’ route. Inside router.post(‘/register’,…) route, an array is added with validation rules that are explained as below. Validation code is added to check full name field value. Check method contains name and message. isLength method checks if the value is entered for full name field. To validate email inside .isEmail method is used. Custom method contains a call to a promise method that receives user email as parameter. When a user registers, we need to make sure that user email does not exist in database. Custom rule calls findUserbyEmail method. If email already exists in the database a message is displayed to user. Email validation call back method is added using promises. In promise construct resolve and reject callbacks are passed. In case of error, an error is thrown in reject, if email exists in database a message is sent back to calling method. If email does not exist resolve method is called. The password is validated in last with .isLength method. In .matches method validates that there must be one integer in password. Password field is compared with confirm password field. After password, other fields are validated. In callback method request, response and next parameters are passed. validateResult method is called and request object is passed to it. If there are validation errors then errors array is sent back to the user. If there are no errors in Else block, the password is encrypted using crypto module. Password is encrypted using sha1 and is assigned to encpassword variable. A JSON document is created and passed to Mongoose User Model. User data is saved to the database. In case of error, an error is thrown otherwise a success message is shown to the user. You can view the data saved into the database. After you have completed the code. It is time to run the application. Now open the browser and type the address below and you can see the running project. 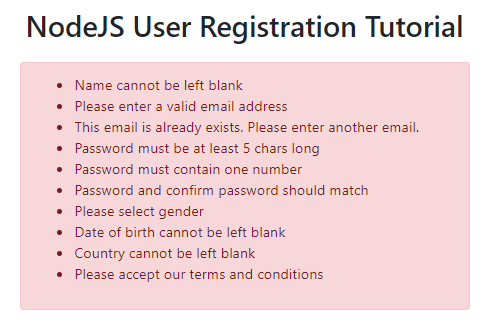 To summarize, in the tutorial above you have learned to create a nodejs user registration. A NodeJS, ExpressJS application is generated, required modules are installed. A form is created. After the user enters data into the form and clicks the register button. Data is validated and saved to the database. You can find the source code of the tutorial on GitHub. When you visit this the link, there is a button on right-hand side, it says, “Clone or download“. You can download the complete source code as a zip file or clone it using Git clone command. Thanks for reading tutorial, Please leave your valuable feedback. Please follow us on twitter, like our Facebook page or subscribe to our newsletter to stay updated on tutorials.